Secret Folder – Keep the honest people honest. Want to hide those online dating profiles, your financial files or other private documents from others who might look over your shoulder or use your Mac? 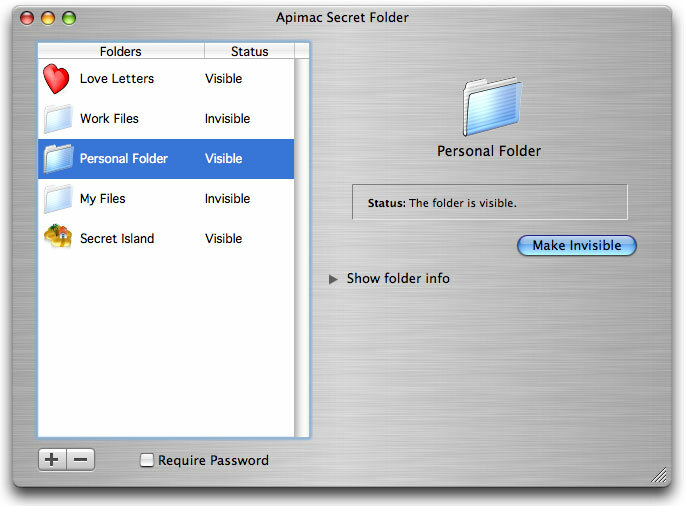 Apimac Secret Folder provides an easy and fast way to protect personal documents and avoid them being seen, modified, or erased by other users. It allows users to hide multiple folders and their contents. Files and folders can be added by means of a single click on a choose dialog box or via drag and drop. It’s not fully encrypted hiding, it’s simple password protection and hiding. Note: If you work for a company like Enron and need secure encryption, this is not it. Or, if you’re hiding anything from a Unix hacker, you’d better be one yourself. But, if you’re just hiding stuff from general mac users, Secret Folder is perfect.